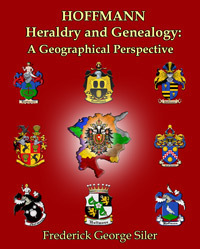 Hoffmann Heraldry and Genealogy: A Geographical Perspective; by Frederick George Siler; 2018; 201 pp; 8.5x11; paperback; ISBN: 978-1-62859-185-9; Item #: FR0702. This volume deals with the Germanic heraldry of families whose name was one of the most common in Germany - that of Hoffman. The Hoffmann surname originated as a term for a farmer who owned his own land as opposed to holding it by rent or feudal obligation. The name comes from the German word hof(f) meaning “settlement,” “manor estate” or “farm” plus the German term Mann for “man.” Later the Hoffmann name came to denote the manager or steward of a manor farm. The name became extremely frequent throughout Central and Eastern Europe, especially among Jews, who in many places were not allowed to own land, but held managerial positions on non-Jewish estates. Because the Hoffmann surname has become widespread, not only in Germany, Austria, and eastern Switzerland, but throughout Central and Eastern Europe, many different spellings have arisen over the centuries. In English and other European languages, such as Yiddish and Dutch, the name is also spelled as Gofman, Hauffman, Hoeffmann, Hoefman, Hoffman, Hoffmann, Hoffmanne, Hoffmanns, Hoffmmann, Hofman, Hofmann, Hofmanne, Hofmans, Hofmmann, Hopman, Houghman, Hoveman, Huffman, Huffmann, Hufman and many more. It should be noted that the volume is heavily footnoted, allowing the researcher to locate and examine the original source materials from which the author drew his information. An amazing place index is found at the rear of the book, allowing genealogists to often associate a specific place with Hoffman families. It is the author's belief that there is often a coat of arms that may be associated with one's European ancestor. It may not be that of a direct ancestor or that of one's ancestral family, but it could well be linked, if only by the proximity of geographical location. Colorful plates of 44 coats-of-arms along with genealogical and geographical information on 95 Hofmann, Hoffmann and Hofman families.